Spring has finally sprung! The garden is in full glorious bloom, the birds are singing their little hearts out and the kitchen is switching gears to produce lighter meals with spring flavors. To celebrate spring’s arrival, I made a gorgeous niçoise salad dressed with a citrusy Meyer lemon vinaigrette and served it with spice-rubbed salmon, grilled on a cedar plank. 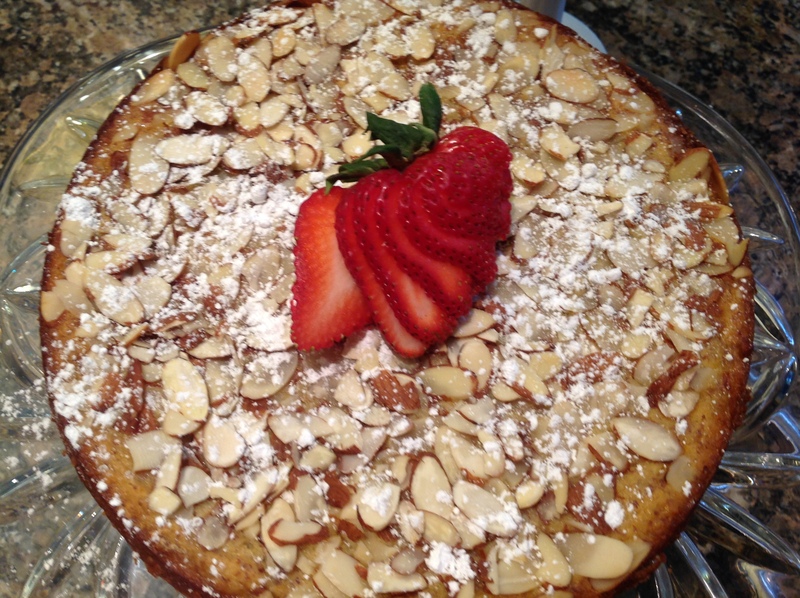 A Meyer lemon ricotta cake I featured last week made for a light springtime dessert. A simple fresh menu, all gluten free, complete with a centerpiece from my garden. 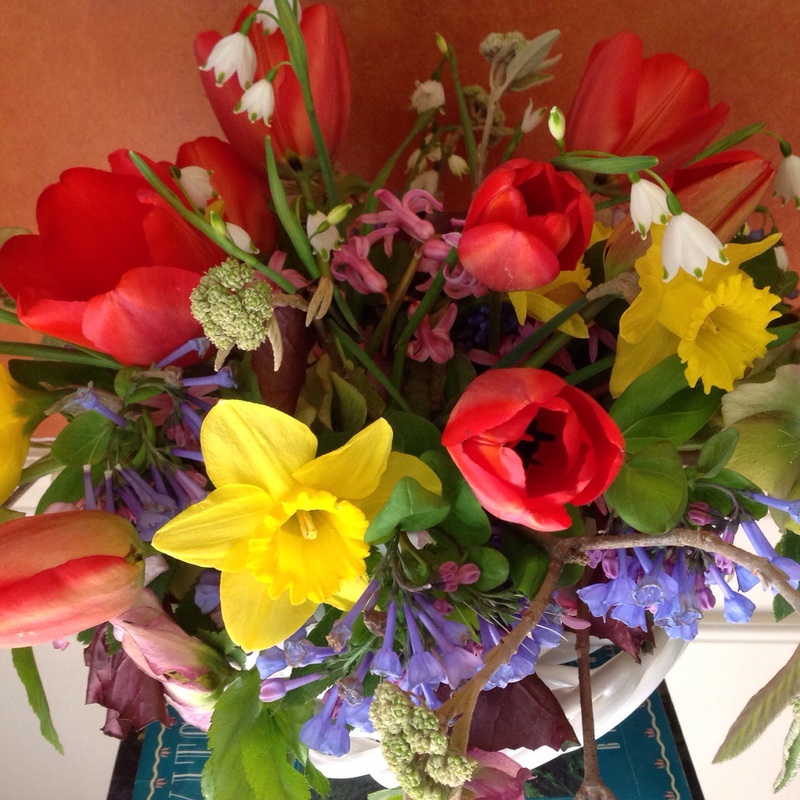 Colorful spring arrangement from my garden: red tulips, daffodils, leucojum, Virginia bluebells, pink hellebores, viburnum branches still in bud. 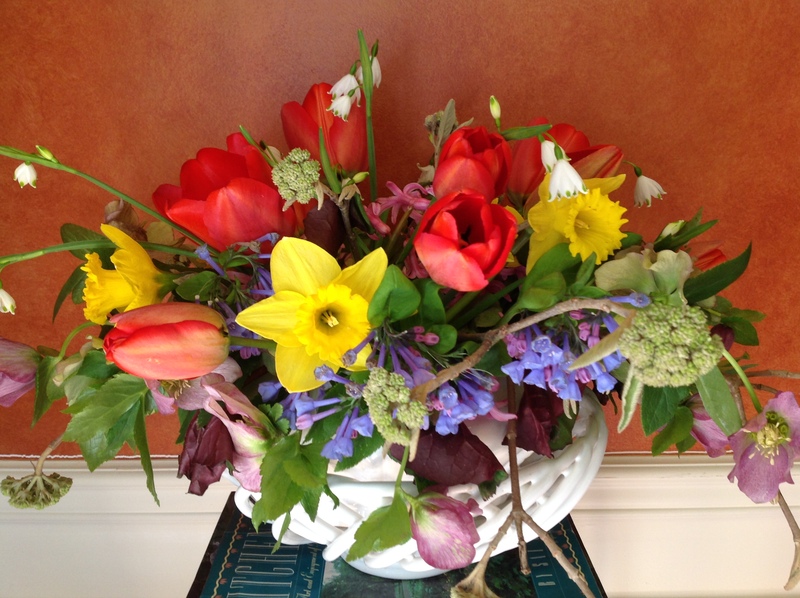 Do you recognize the trellis bread basket standing in as a vase? The table setting: cream place mats and plates topped with antique trellis-edged salad plates with floral details and botanical motif napkins(Anthropologie). Mini ceramic urns hold breadsticks and flatbreads. 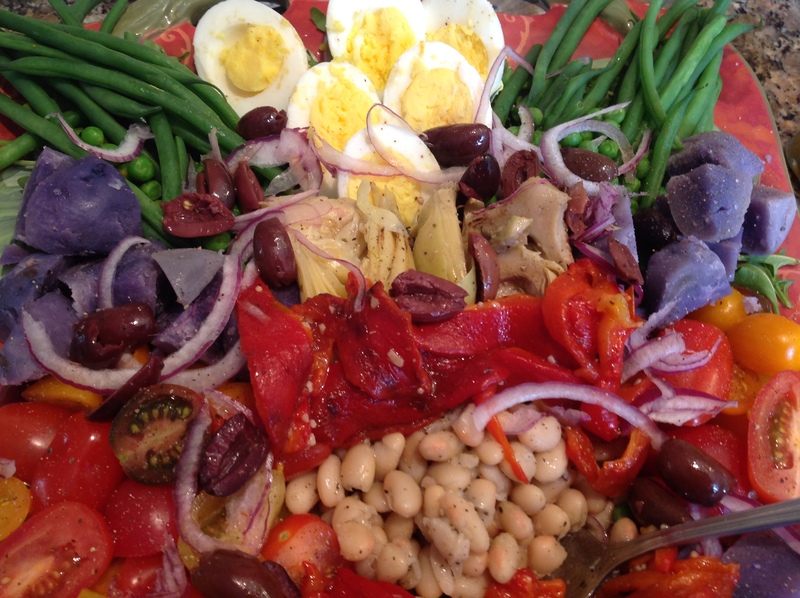 The niçoise salad was updated for spring with fresh peas, gorgeous purple new potatoes(Trader Joe’s) and a medley of heirloom tomatoes in multiple sizes with a Meyer lemon vinaigrette which was to die for. Shake all ingredients together in a small jar and serve alongside the salad.This type of salad is best served with hinged tongs. 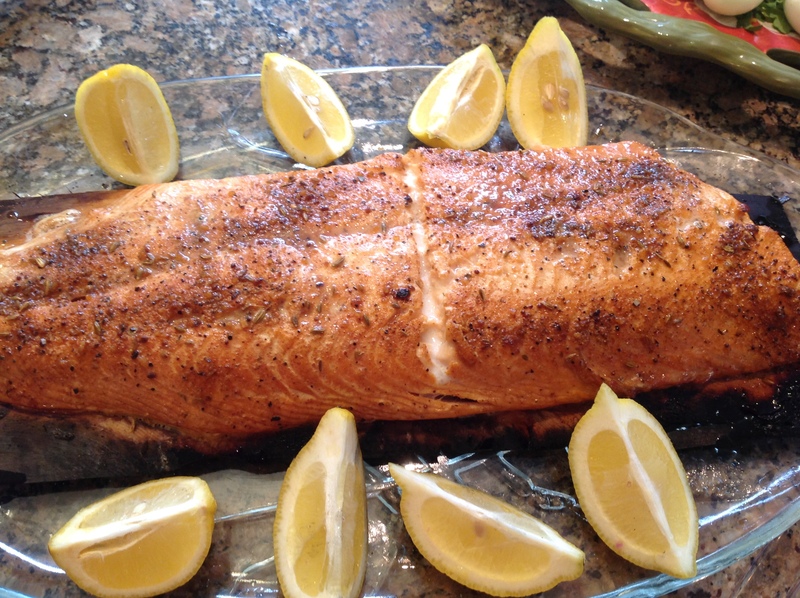 The salad accompanied a spice-rubbed cedar-planked grilled salmon fillet. The spice rub is one I make and use all year round. It adds a great smoky flavor to seafood or grilled meats without the need for BBQ sauces. The recipe can be found here. 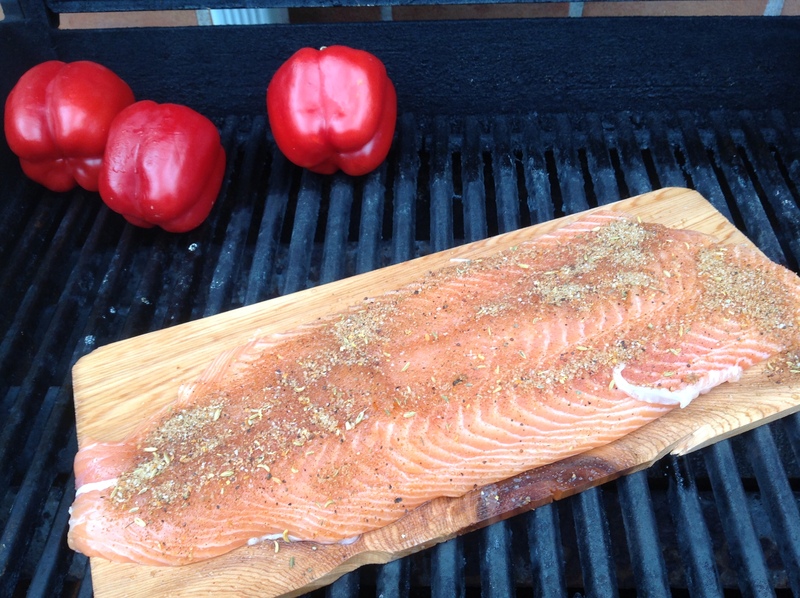 Instructions on how to grill a cedar planked salmon fillet can be found here. Meyer Lemon Ricotta cake made with ground almonds was light and moist. Recipe here. 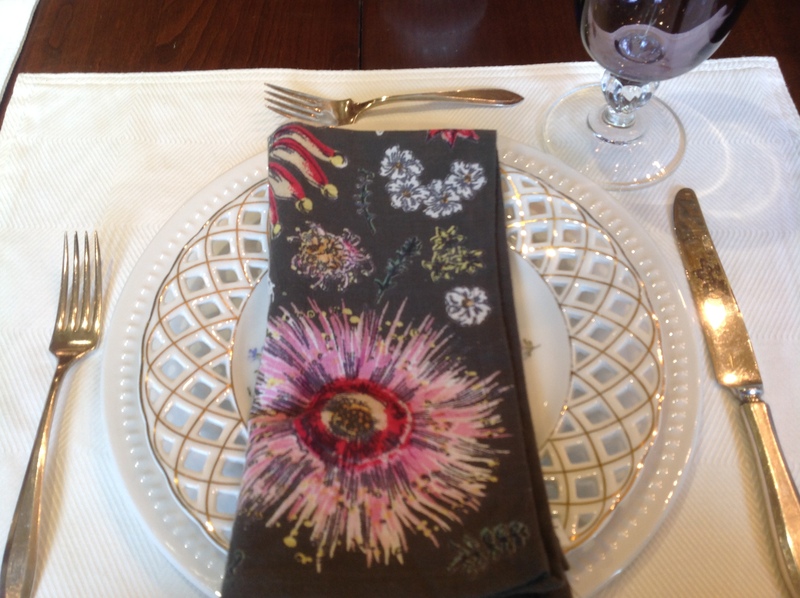 I hope this menu has inspired your spring entertaining! This entry was posted in Entertaining, Gardening, Recipes, Tablescapes and tagged Anthropologie black floral napkins, anthropologie botanical napkins, meyer lemon vinaigrette, nicoise salad platter with fresh peas, spice rubbed cedar planked salmon fillet, spring nicoise salad by Johanne Lamarche. Bookmark the permalink. It was!! Chris and I enjoyed the left overs too. He is the master of planked salmon, my man. A slight variation of this will be served at the next French bistro Joanne! Be forewarned! This one covers all veggie color spectrum for sure! This is a beautiful salad Johanne. I love dishes like these when we come out from under the winter blankets! Me too, Julie! Did you save me a slice of pie???? 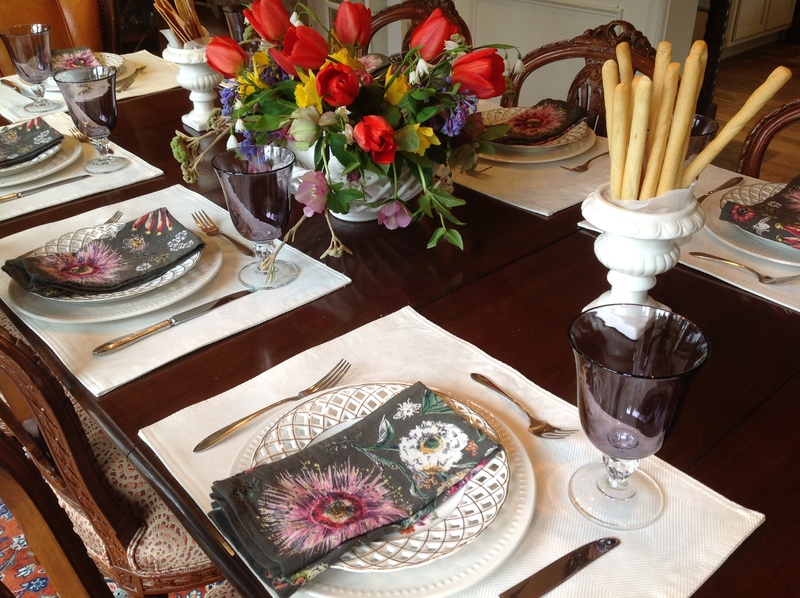 You really have an artistic flair when you put your tablescape together Johanne. Love all the flowers from your garden. Also love the nicoise salad with the planked salmon. I can almost taste all the flavors, what a burst of spring goodness! 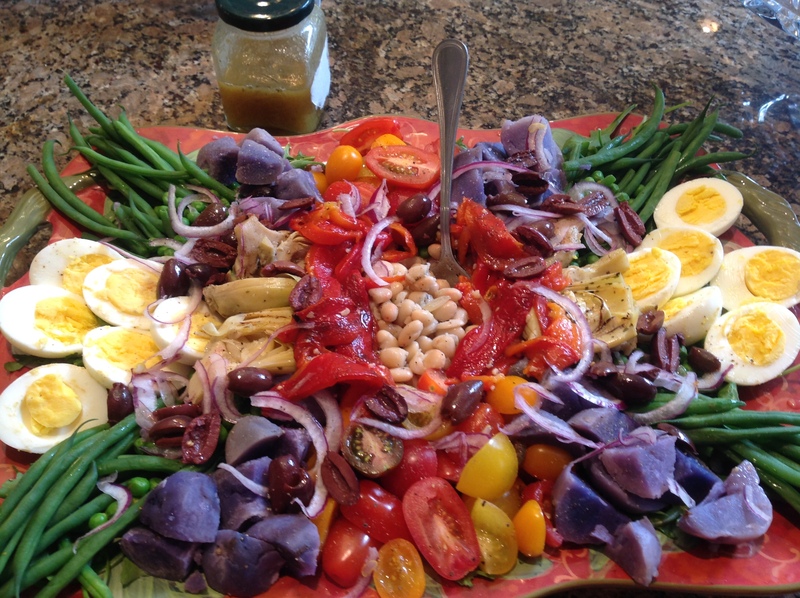 I do tie the garden into most of my entertaining, Loretta and I had to laugh when I saw my pictures….the salad is color coordinated with the flowers…quite unintentially! Chanticleer is already so beautiful. Looking forward to having you visit! Congratulations Loretta! I will look for you on Instagram. Groffs was my mother-in-law’s favorite nursery. Reading your note made me nostalgic. We lost her 14 yrs ago almost to the day. The garden party sounds fabulous. Can’t wait to hear about it. I bribed a Chanticleer gardener with cookies once. Here’s the link. Maybe it’s the same horticulturalist. LOL. Hearing from you always brightens my day Pang! So nice of you to compliment the flowers and the menu. I can only imagine how your camera could have captured the images! You have such a gift. Thank you so much Zeba! Spring is so magnificent in Pennsylvania compared to Northern Canada where I grew up. I am amazed by the beauty every single year. You caught me with my hands full of lemons Ginger! I even had a big bowl on my island and have a gardener’s scrub with….lemon….coming soon on the blog! I love lemon anything but it did cross my mind that maybe I had put too much in this menu!! No one complained. That cake was really delicious! I can’t wait for more lemony recipes from you! Hi Mollie! I loved everything about this meal too and could eat it over and over and never tire of it. I think I hit every color imaginable in the salad veggies. I was so happy the purple potatoes stayed purple after cooking as many purple vegetables like cauliflower lose their color after cooking. Hope you are enjoying spring! Well, we can only hope its still coming, lol! After leaving Northern Ontario, spring stunned me. At home, it was one long drawn out melt of snow with dusty dirty sand everywhere. It was a revelation when I went south to London for university and even more so in PA. Wishing you some spring…..soon!!!!! Goodness – I’m about to google map you and drive down – that salad is irresistible. And your table looks beautiful. Those flowers….!!! I’ll make you that salad anytime, Lindy!